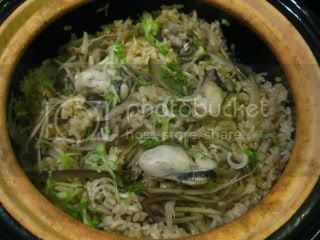 Oyster and bordock are such a great combination, and they are winter's seasonal ingredients. Both ingredients have distinctive savory flavor profiles, and I just love the m so much. Once you get the ingredients, this dish is really easy to make, and double-lid donabe rice cooker, "Kamado-san" will do the work for you. For oysters, I get a quality kind in a jar, and I rinse them throughly after mixing with some potato starch ("katakuriko") and salt. This quick process will help removing any gritty stuff from the oysters. Rinsed oysters are cooked in seasoning just for a few minutes and set aside. I used lightly-polished brown rice (I polished right right before cooking with my home rice polisher). 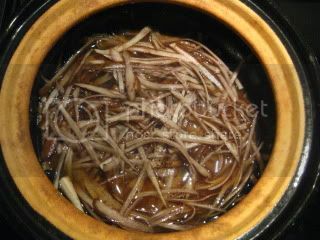 Burdock root was cooked with rice in dashi stock. 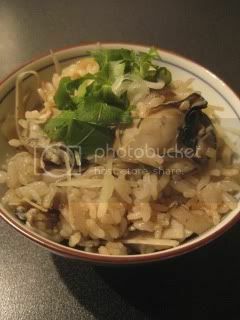 Once the rice was cooked, the oysters were added and tossed with rice. 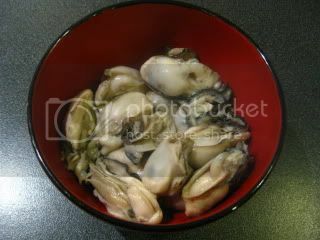 In a bowl, combine the oysters with the salt and potato starch. Mix throughly by hand. Rinse well and drain. Set aside. 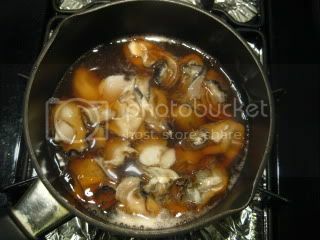 In a small pot, combine the sake, mirin, soy sauce, and 1/2 cup (120 ml) of the dashi stock and set over medium-heat. Once the broth starts simmering, add the oysters and simmer until the oysters become plump and just cooked through (about 2 minutes). Strain the broth into a measuring cup and add the remaining dashi stock so that it becomes 1.5 cup (360 ml). Refrigerate until it cools down to a room temperature or lower. Keep the oysters separately in refrigerator also. In "Kamado-san", combine the rice with the broth. 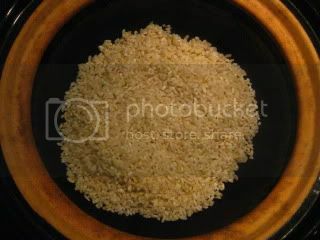 Spread the burdock root over the rice. Let the rice soak in liquid for 20 minutes. Cover "Kamado-san" with both lids and cook over medium-high heat for 13-15 minutes, or until 2-3 minutes after the steam starts puffing out of the top lid. Turn off the heat and let it stand for 15 minutes. 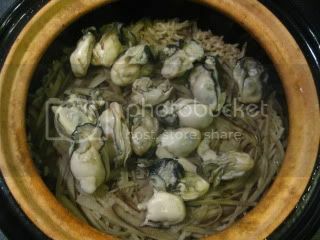 Remove the lids and very quickly add the cooked oysters and cover with lids again. Let stand for 5 more minutes. Remove the lids and gently fluff the rice with a rice paddle. Garnish with ginger and scallion and serve. Really lovely. I think the next time, I will even double the amount of the oysters to make it decadent-style!